Website and processes: 4 May 16 Cathy, 4/5 Good "Excellent contact by email confirming a spot available for a booking." Serious about becoming a Skydiver? Then this is for you. A minimum of 6 hours ground training. With the maximum amount of time in freefall, and the very best instructors at your side, you'll get the ultimate experience! This is the course for those who are really serious about becoming a Skydiver. 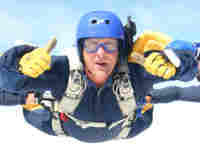 It is the fast-track route to becoming a British Parachute Association 'Category 8' Qualified Solo Skydiver. The programme is termed 'Accelerated' because the learning process is three to five times faster than alternative training systems - sorry, you don't fall faster! To achieve this, AFF Instructors accompany you in freefall and provide direct tuition during each 50 second skydive, assessing and improving your performance moment by moment, giving you both time and help to gain confidence and overcome any fears. Our highly qualified AFF Instructors will guide you through a minimum of six hours Ground Training, covering all you need to know in order to successfully complete your skydive. When your Instructors are happy with your performance on the ground, you will make your Level 1 skydive from 13,000 feet with two Instructors holding on to you. They continue to teach you during freefall using a system of hand signals: direct in-air instruction is the most effective way to learn Skydiving! So that we can help you after your parachute is open as well, you will wear a radio. After every AFF jump, a comprehensive debrief takes place with your Instructors, followed by additional training both to improve skills learned already and add those required for the next jump. With the maximum amount of time in freefall, and the very best instructors at your side (these guys have done over 5000 skydives each! ), you'll get the ultimate experience! Once you've deployed your own parachute (yes, on your first jump! ), you'll fly it safely back to the landing area yourself and meet your instructors for a de-brief and lots of congratulations. This jump offers you the ultimate in skydiving experiences and the biggest sense of achievement available! Will you challenge yourself and go for it?! Please wear comfortable clothing such as a track suit, and a pair of trainers. You will be in a group of no more than four students, ensuring individual attention. All parachutists will be required to sign a declaration of medical fitness. In the case of any person over the age of 40, a BPA Medical Certificate signed by a doctor is required. This will be forwarded to you if you make a booking. The upper weight limit is approx. 15.5 stone, please contact us if you are near this limit.